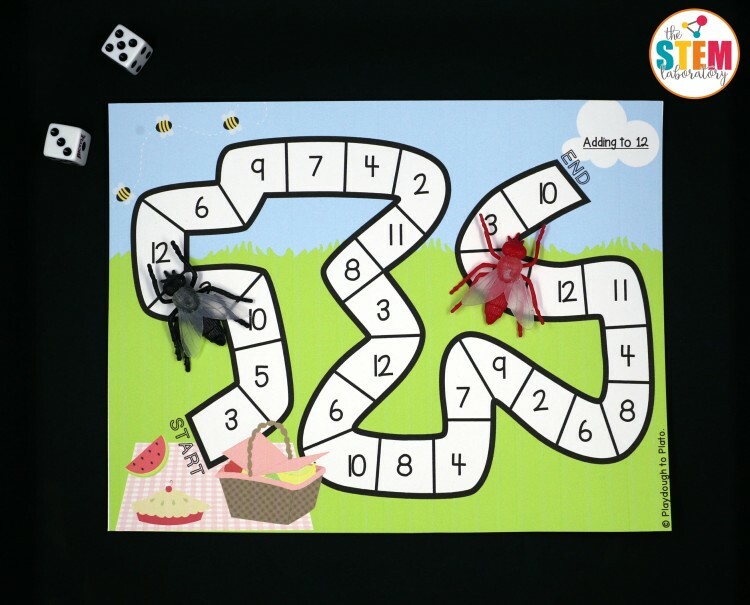 Nothing screams fun quite like a batch of creepy crawly bugs! 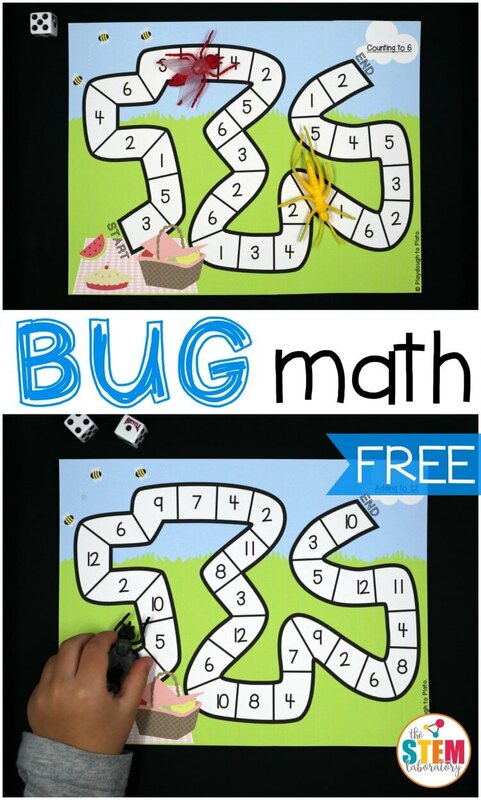 Kids will love practicing counting and addition with these playful bug race math games. 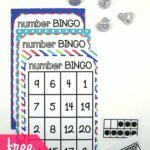 They’re perfect to use as math centers, homeschool activities or a ready to go afternoon game. The prep for this game was as quick as it comes. 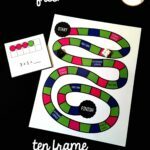 I printed the game boards (below) on cardstock to give them extra durability and grabbed two dice and a handful of bugs I picked up from the Dollar Store. 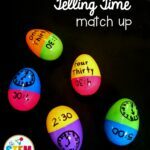 I created two versions of the game to make it easy to differentiate for a variety of learners. 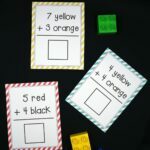 I wanted Middle Brother (age 4.5) to warm up by practicing counting to six so we started with the first game. 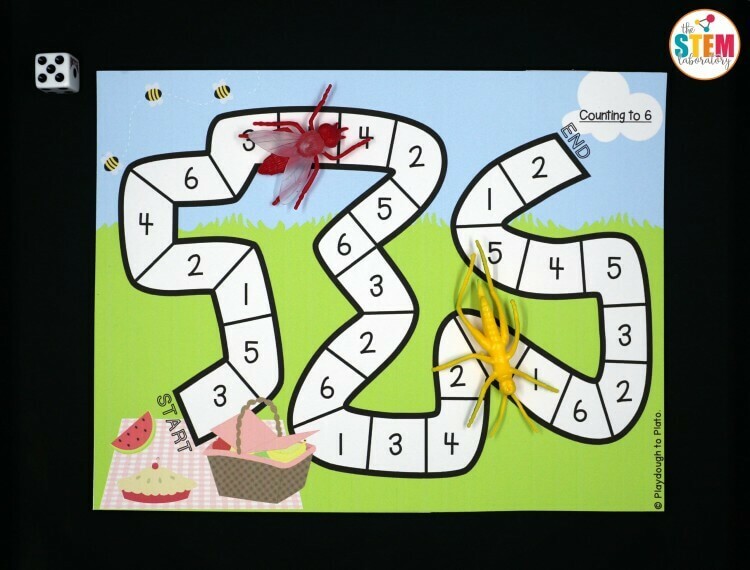 He eagerly picked one of the plastic bugs to use as his counter and placed it next to my bug on the start line. I explained that our hungry bugs had stumbled across a picnic. 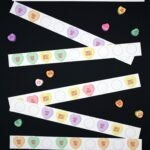 Their stomachs were growling so they couldn’t resist grabbing a few crumbs to fill their bellies. Now they were racing to run away before the picnic goers caught them. Middle Brother was excited for the challenge. 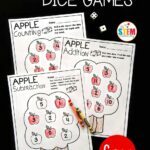 He eagerly rolled one die and counted the number of dots that landed on top. “Four!” he called out. He found the first four written on the path and moved his bug to that space. 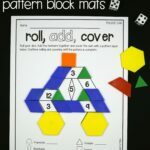 I was up next and rolled a two. I found the first two on the path and placed my bug on top of it. One roll after another, we inched our way to the finish line. 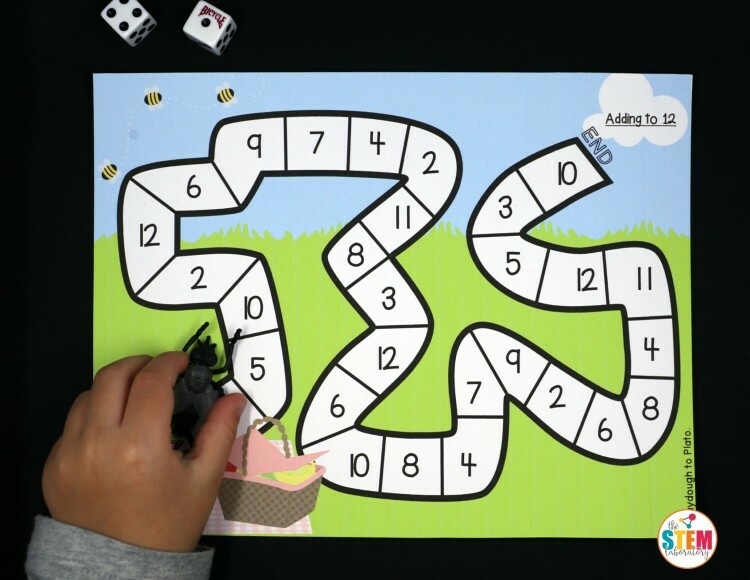 When our first round was complete, I pulled out the second version of the game: Addition Bug Race! 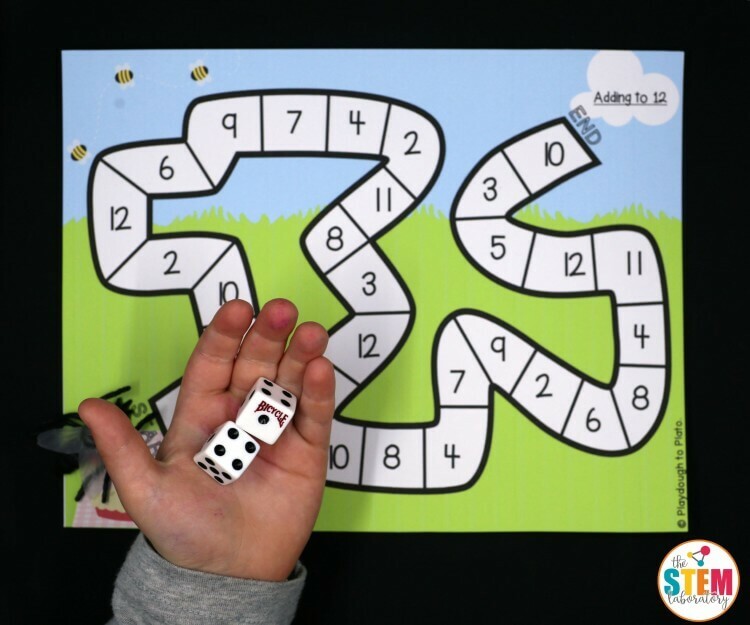 The premise was the same – our bugs were racing to the finish line just like before – but this time we needed to roll TWO dice and add the numbers together to get a sum. 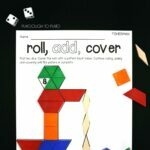 Middle Brother’s first roll was a five. He searched the path and moved his bug to the first five he could find. 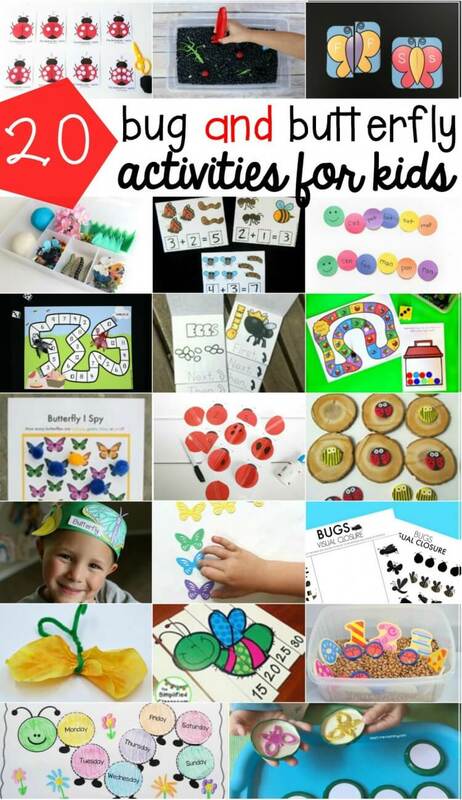 Click the blue button below to download your free bug race games and then check out 20 more bug and butterfly activities your kids will love!